This is all of our Christmas stuff that we offer. We have Christmas Sunday School Lesson plans for preschool, kindergarten, elementary kids, Christmas Coloring pages, Christmas snack ideas, Christmas mazes, Christmas Puzzles, Christmas clipart and so much more. Just click on a link below to take you to the page you want. It's all FREE! Just use this in Sunday school class or in Children's Church. We sell Wooden Christmas Ornaments in our store. We offer wood Christmas trees, wood snowflakes, wood stockings, wood Mittens and wood stars. 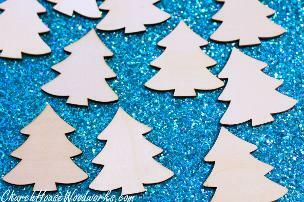 These would make great DIY Christmas crafts for the kids to do. You can paint them and add a hole to the ornament and hang on the tree. Or use them in your Christmas villages set or use them in a DIY Christmas wreath! You can buy them on our other website.